SCHEDEL -[Text page with Saints, and a view of Estett.] Terta Etas Mundi. Foliu. CLXII. SCHEDEL, Hartmann. - [Text page with Saints, and a view of Estett.] Terta Etas Mundi. Foliu. CLXII. [Text page with Saints, and a view of Estett.] Terta Etas Mundi. Foliu. CLXII. - SCHEDEL, Hartmann. Title : [Text page with Saints, and a view of Estett.] Terta Etas Mundi. Foliu. CLXII.. Description :Text page with woodcuts of Saints among which : Saint Willibald and Saint Walpurga. Saint Walpurga was a niece of Saint Boniface and, according to legend, a daughter of the Saxon prince St. Richard. Together with her brothers she travelled to Franconia, Germany, where she became a nun and lived in the convent of Heidenheim, which was founded by her brother Willibald. Also on recto a view of Estett. The verso side is printed with text and depicts Saint Sebaldus among others. 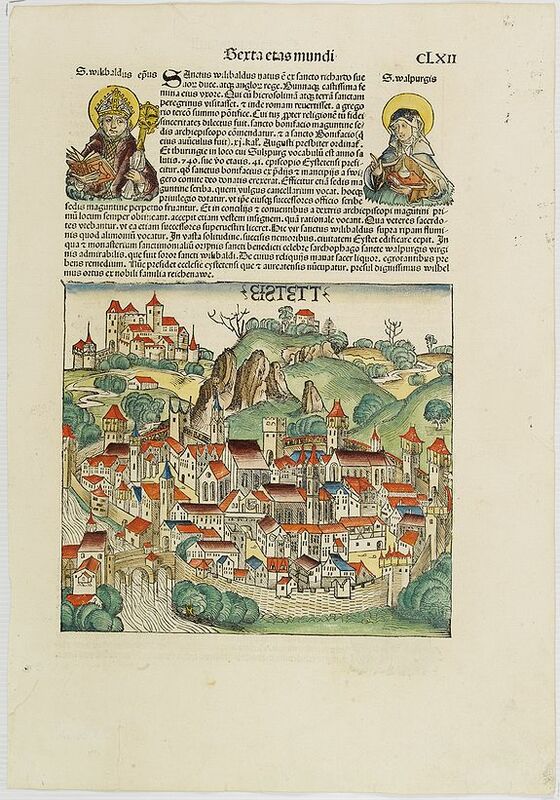 Sebaldus of Nuremberg (Sinibald, Sebald) is venerated as the patron saint of Nuremberg, traditional administrative center of Franconia, and the guarantor of its independence. His legend makes him a hermit and missionary. Condition : Some overall toning. Dark impression on large sheet. Else very good condition.